Projects and departments are special kind of tags (they have members, so it is easy to share information). When we talk about tags we mean projects, departments and tags. The possibilities with tags are endless, we, at MeetingKing, use them to organize our information for bug tracking. The more you work with tags, the more powerful they become! When you add tags to your filter, either through the left navigation or by clicking on tags under a task or meeting, you can navigate back and forth between the pages and see only the information belonging to that tag. When you are on the meetings page, tasks page or calendar page, and you create a new meeting or task it will automatically get that tag and be part of that project, department or tag. But I hate adding tags! Tagging often doesn’t work because it is too much work. Not in MeetingKing. We made it really easy. If you add a tag to a meeting everything in that meeting, including the tasks, will get that tag. If you add a tag to a topic everything under that topic will get that tag. If you are in meetings overview, task overview or your calendar and you create a new task or meeting, this task or meeting will automatically get all the tags listed at the top of the page. 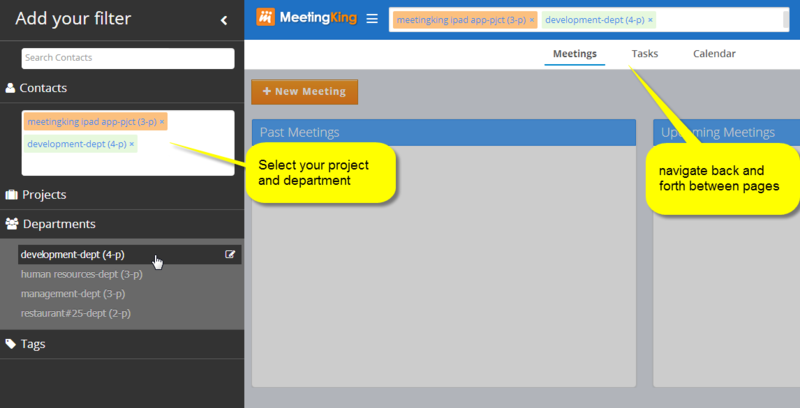 If you create a follow-up meeting your new meeting will automatically get the tags from the previous meeting. In addition you can always add tags to any items and that way make it part of a project or department.